Dr.S.Ahamed Ibrahim obtained his M.Sc degree in medical biochemistry from JIPMER, Pondicherry and PhD in biochemistry from Christian Medical College and Hospital, Vellore. He joined the institute in 1997 and presently heading the lipid chemistry division. Dr.Ibrahim’s research work is focused on optimal fat requirement for the prevention of diet related chronic diseases such as diabetes, inflammatory bowel disease, nonalcoholic fatty liver disease. His earlier studies showed that dietary saturated and trans fatty acids induce insulin resistance and compared to saturated fatty acids, trans fatty acids induce insulin resistance to a greater extent. Studies also showed that maternal intake of trans fatty acids predispose the offspring to insulin resistance and possibly increasing the risk of developing type 2 diabetes in later life. Currently studies are in progress to understand the role of dietary fatty acids in the development and progression of nonalcoholic fatty liver disease. Our future research plan also involves investigation of the role of gut-liver axis in the development and progression of nonalcoholic fatty liver disease. 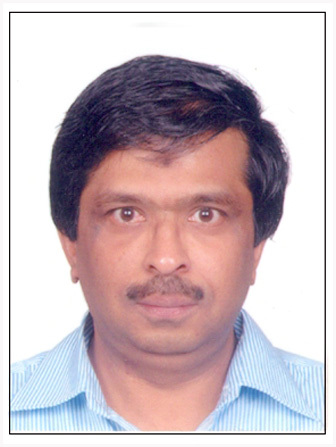 He is a research supervisor in biochemistry at Osmania university, Hyderabad and presently guiding two PhD students. JeyapalSugeedha, Kona Suryam Reddy, MullapudiVenkataSurekha, PutchaUday Kumar, PuvaneswariGurumurthy and Ahamed Ibrahim. Substitution of linoleic acid with α-linolenic acid or long chain n-3 polyunsaturated fatty acid prevents Western diet induced non-alcoholic steatohepatitis. Scientific Reports. 2018, July 19: 8:10953.DOI: 10.1038/s41598-018-29222-y. JeyapalSugeedha, PutchaUday Kumar, MullapudiVenkataSurekha, SudipGhosh, Anil Sakamuri, Kona Suryam Reddy, VadakattuSaiSantosh, ChandanaMadakasira, Ahamed Ibrahim. Chronic consumption of fructose in combination with trans fatty acids but not with saturated fatty acids induces nonalcoholic steatohepatitis with fibrosis in rats. European Journal of Nutrition. 2017 (In press). DOI: 10.1007/s00394-017-1492-1. Anil Sakamuri, SujathaPitla, Uday Kumar Putcha, SugeedhaJayapal, SailajaPothana, SaiSantoshVadakattu, Nagabhushan Reddy Konapalli, Siva SankaraVara Prasad Sakamuri, and Ahamed Ibrahim. Transient Decrease in Circulatory Testosterone and Homocysteine Precedes the Development of Metabolic Syndrome Features in Fructose-Fed Sprague Dawley Rats. J NutrMetab, 2016, 7510840. 1-11. DOI: 10.1155/2016/7510840. Ahamed Ibrahim. Scientific basis of fat requirement for Indians and recent trends in cardiovascular diseases. 2014, Ind J Commu Health: 24; Supl 1; 54-58. Tyagi A, Kumar U, Reddy S, Santosh VS, Mohammed SB, Ehtesham NZ, Ibrahim A. Attenuation of colonic inflammation by partial replacement of dietary linoleic acid with α-linolenic acid in a rat model of inflammatory bowel disease. 2012. British Journal of Nutrition. 16:1-11. DOI: 10.1017/S0007114511007197. Misra A, Sharma R, Gulati S, Joshi SR, Sharma V, Ghafoorunissa, Ibrahim A, Joshi S, Laxmaiah A, Kurpad A, Raj RK, Mohan V, Chandalia H, Krishnaswamy K, Boindala S, Gopalan S, Bhattiprolu SK, Modi S, Vikram NK, Makkar BM, Mathur M, Dey S, Vasudevan S, Gupta SP, Puri S, Joshi P, Khanna K, Mathur P, Krishnaswamy S, Madan J, Karmarkar M, Seth V, Passi SJ, Chadha D, Bhardwaj S; National Dietary Guidelines Consensus Group. Consensus dietary guidelines for healthy living and prevention of obesity, the metabolic syndrome, diabetes, and related disorders in Asian Indians (2011). Diabetes TechnolTher. 2011 Jun;13(6):683-94. DOI: 10.1089/dia.2010.0198. Rajendra Prasad Agrawal, Poornima Sharma, Shreyans Jain, Gafoorunissa, Ahamed Ibrahim, Bela Shah, D.K. Shukla and TanveerKaur. Effect of camel milk on glucose metabolism in adults with normal glucose tolerance and type 2 diabetes in Raica community: a crossover study. (2011). ACTA BIOMED; 82: 181-186. Ahamed Ibrahim, Ghafoorunissa, Sanjay Basak and Nasreen Z. Ehtesham. Impact of maternal dietary fatty acid composition on glucose and lipid metabolism in male rat offspring aged 105 d (2009). British Journal of Nutrition. 102: 233-241. DOI: 10.1017/S0007114508198993. Trans fatty acids and their health implications. Nutrition in disease management, Update series 52, Page no : 1-14, October 2011, published by Centre for research on nutrition support systems and Nutrition Foundation of India. Member, Scientific panel of Oils and Fats, Food Safety and Standards Authority of India, FSSAI (2018-2021).